Gap year and summer programs in Uganda – volunteer and travel. Live and volunteer in a rural community in Uganda will be an unforgettable experience – get to know the local people and visit incredible locations. You’ll find your second home. Winston Churchill deservedly called Uganda “The Pearl of Africa”! It is one of the most beautiful countries on the continent, with fantastic natural scenery – the highest mountain range in Africa (The Rwenzoris), dense tropical forests, deep river valleys and lakes, tea and banana plantations, national wildlife reserves and magnificent Lake Victoria. Despite being home to half the world’s remaining mountain gorillas in the forests along the south-western border, most tourists have not yet discovered what Uganda has to offer. Volunteering in Uganda with AV will give you an amazing insight into rural life! Jinja is at the source of the mightiest river in the world – the Nile – with world-class white water rafting on its doorstep. Spending your gap year in Uganda volunteering and travelling will be an unforgettable experience. Our gap year projects and volunteering opportunities in Uganda give you the chance to help a rural community through teaching for anything from two to twelve weeks. 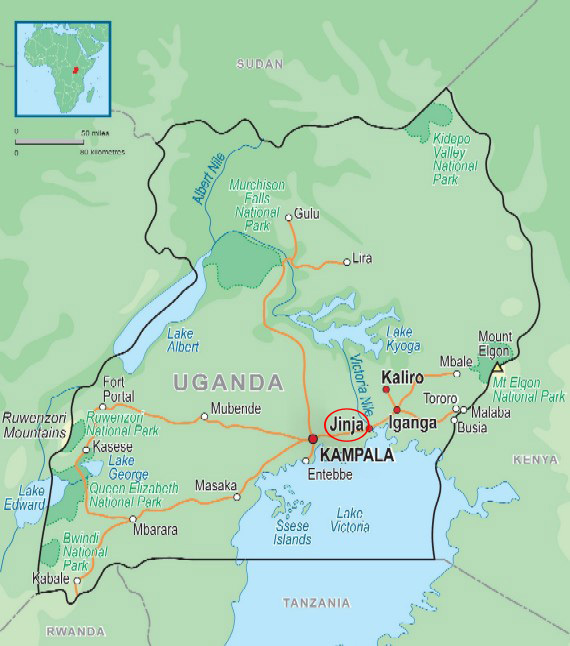 The programs take place in rural communities around the area of Jinja, on the shores of Africa’s largest lake – Lake Victoria, and close to the source of the mighty River Nile. As a volunteer in Uganda you will have the chance to help children with writing, reading and speaking English; coach sports; get involved in extra curricular clubs; and work in the wider community. Tell us what you want to do and we will make it happen! Whether it’s teaching academic subjects, music, drama, arts and crafts, or coaching sports, your contribution will be met with enormous gratitude. Together with fellow volunteers you will live in local houses, with a high level of independence. Spending significant time in one place lets you become fully involved and gain a sense of achievement. Uganda enjoys a warm tropical climate with temperatures averaging about 26°C during the day and 16°C at night. The hottest months are from December to February. The rainy seasons are from April to May and October to November. There is a good clinic in Jinja, which is a branch of Dr Stockley’s Surgery in Kampala. There is an excellent hospital in Kampala for anything more serious. You will be advised on all medical and hygiene issues on the orientation course. Uganda is not expensive and most AVs say it is considerably cheaper than Kenya or Tanzania. AVs can eat well for about £10 per week per pair, which is well within the allowances given to you by AV. When travelling, most backpackers can live quite well for about £17 a day, and travel by coach is cheap. There are ATMs in most large towns – certainly Kampala and Jinja and Iganga (if the ATM is working!). You must have Visa debit or credit card. Mastercard is just not accepted.